I went a little overboard at Tower Grove farmers market last Saturday, buying bunches of radishes from two vendors. I couldn't resist those red & white beauties! While I love eating fresh raw radishes dipped in herb salt or sliced thin on toasted bread with herb better (Herbes de Provence is my favorite to use), I knew I wanted to try roasting them instead...a recipe I've seen lately on foodie pic sites such as Foodgawker. Initially, I saw the recipe on a blog called The Bitten Word. They weren't 100% enamored with the results, so I decided to look at the original recipe, which was printed in Food & Wine last month. And, whadda ya know! It's Gerard Craft's recipe! I just met him on Thursday when I enjoyed a wine dinner at his restaurant, Niche! For those of you who aren't aware, Chef Craft was chosen as one of Food & Wine's Best New Chefs last year. I've eaten at Niche twice now (the first was for my 35th birthday in October) and the food has been superb each time (and he was nice to talk to, which is always a plus!). Anyway, I really liked the roasted radishes. While they do lose their crisp pepperiness, the addition of lemon with the bitter greens creates a nicely tart side dish. According to Food & Wine, "Gerard Craft came up with this clever recipe one year when his local farmer had an abundance of radishes. Craft tried roasting them. The result: warm, crisp-tender radishes with delightfully bitter greens, which he finishes with butter and lemon." I made roasted radishes a few years ago and was surprised how much I liked them! Reading your blog has given me a new perspective on radishes with bread, salt and butter...I'm now going to try them with Herbes de Provence butter! 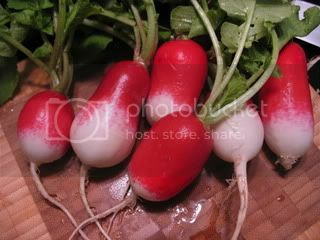 Raw radishes are just too harsh for my system, yet I love them and have an abundance from the garden this year! Thank you.